The Mahjong Logic platform offers intriguing game play and stunning graphics. The downloadable client is designed to be totally platform-independent, currently available for Windows and Mac OSX and soon to be released in a brand new HTML5 version. The Mahjong Logic Network uses a scalable, clustered server system allowing for any number of simultaneous players. Mahjong Logic can easily be integrated with an existing gaming solution or it can be operated as a stand-alone client. A subscription or Play-for-Points model can be made available upon request. The Mahjong installation has Chinese Official (MCR), Hong Kong, Riichi, Shenzhen and Chinese Classic rule sets. Additional rule sets will be added when necessary to cater to local markets. Mahjong Logic offers several gaming options to accommodate all types of players. Players can choose from real money games and practice play tables. In real money mode, customers can choose between three separate cash games and a realistic tournament style game. All cash game types can be played with 2, 3 or 4 players. An invite feature ensures that tables fill up quickly, yet players can also select their preferred game version and table from the lobby. Single Hand – A fast and entertaining way to enjoy the game! 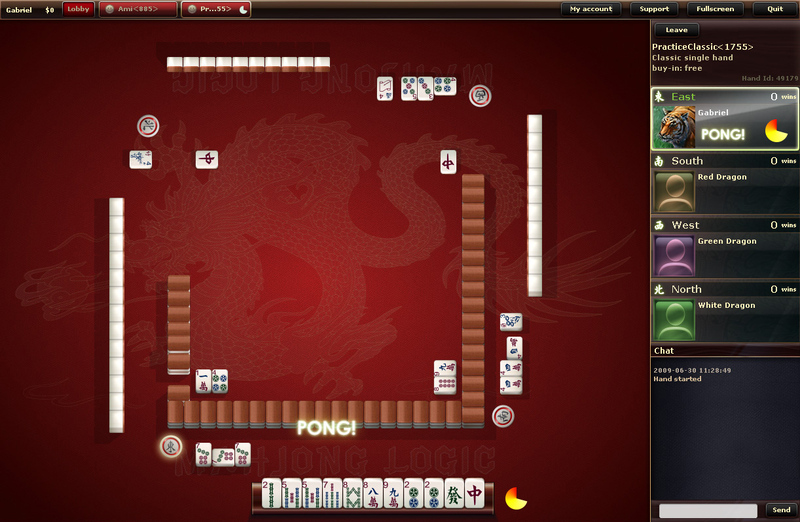 This version is played without having to consider the traditional point calculations; the player that declares Mahjong wins the combined table wager. Single hand games can be played with 2, 3 or 4 players. Full Game Mahjong – experience Mahjong the classic way: rich in atmosphere, and rewarding skillful play where you must balance a quick score against going for a higher-paying hand instead. East only – is our new faster four player game where all players play one round as the east wind. East only is a faster version of the Full Game mode – it takes about 15 minutes to play. Multi Table Tournaments – Realistic and lifelike where participants play a number of time-based rounds of Mahjong. The player who collects the most table points during a number of rounds wins. Multi Table Tournaments can be played with thousands of simultaneous players.